Today, April 6, is the International Day of Sport for Development and Peace. As the Syrian conflict moves into its sixth year, we are all painfully aware of the devastation and horrific violence inflicted upon its people. According to UNHCR, approximately 4.8 million people have fled to neighboring countries in search of safety and shelter, with 6.6 million remaining displaced inside Syria. Fleeing for their lives, untold numbers of people, young and old, have attempted treacherous journeys no person should ever have to face. Thousands did not reach their destination. And those who do reach the borders and shores of foreign lands discover it is merely the starting point of a long and difficult road ahead. The impact of such numbers is overwhelming on the host communities. Turkey now hosts the largest number of Syrian refugees in the world, and in Lebanon, a country with the highest number of refugees per capita, one in every four people is now a refugee. In Jordan it is one in five. It is important to understand that at present, an estimated 90% of the Syrian refugees are not in refugee camps but are surviving in host communities, taking them to breaking point. There are enormous pressures – for both refugees and host community populations – on shelter, food, water, fuel, education and health services, formal and informal sector employment. Over 50% of these refugees are under the age of 18. For children and youth in their formative years, the devastation of prolonged exposure to harrowing physical and psychological violence and trauma is further compounded by the isolation and ostracism they experience in their new host communities, by lack of access to education, and by resort to extreme coping mechanisms to survive, including child labor and forced early marriage. 2.4 million children displaced by the Syrian crisis are growing up as refugees; a lost generation filled with hopelessness and resentment, vulnerable to radicalization and extremism, that risks being a time-bomb for the future. Whilst the situation in these host communities is a bubbling pot threatening to boil-over, the fuel to the fire is the conflict in Syria. Until that fire is extinguished every effort must be made to keep the lid on the boiling pot, by easing the pressures on host communities and strengthening the individual and collective resilience of refugee and host community populations together. This is where sport has a role to contribute. In 2007, I co-founded Generations For Peace, a global peacebuilding organization dedicated to sustainable youth-led conflict transformation at the grassroots. Through our experience in diverse conflict contexts in 50 countries we have developed a unique approach to using sport to achieve peacebuilding outcomes. Rather than focusing on developing sporting excellence, our sport-based games use the same energy and teamwork dynamic of sport to achieve long-term attitudinal and behavioral changes, transforming personal capacities of participants and the relationships between them, building greater understanding, tolerance and trust, strengthening resilience and social cohesion. This reduces isolation and increases the social capital, which communities can draw upon for support, providing positive alternatives to more-extreme coping mechanisms. All Generations For Peace activities are led by volunteer leaders of youth, passionate about addressing local issues of conflict and violence in their own communities, and powering a cascading model for youth-led change. Their role as change-makers in society is crucial and is especially important as a resource in communities facing extreme challenges. With mentoring and support from Generations For Peace, these youth leaders gain real experience of “life skills” and an opportunity to demonstrate their leadership and responsibility to contribute positively to their community, to measure the impact, and to feel the satisfaction of concrete progress which makes a difference in people’s daily lives. “Before the program I did not fully accept the Syrian people; if I saw someone I would say hello or bye but not more than this! But when I integrated with them in the program and through the activities – standing beside the Syrian participants during the activities – I noticed that there is no difference between us. Now, I am a friend to all of them” (Jordanian male youth participant). “The [Syrian and Jordanian] girls were surprised because they had been in the same class in school, in the same school, but they had never spoken together. They had never talked, even in the same neighborhood. Now we are still seeing them speaking together, walking together, the 16- and 17- year old ones. Doesn’t matter what nationality they are” (Jordanian female volunteer). 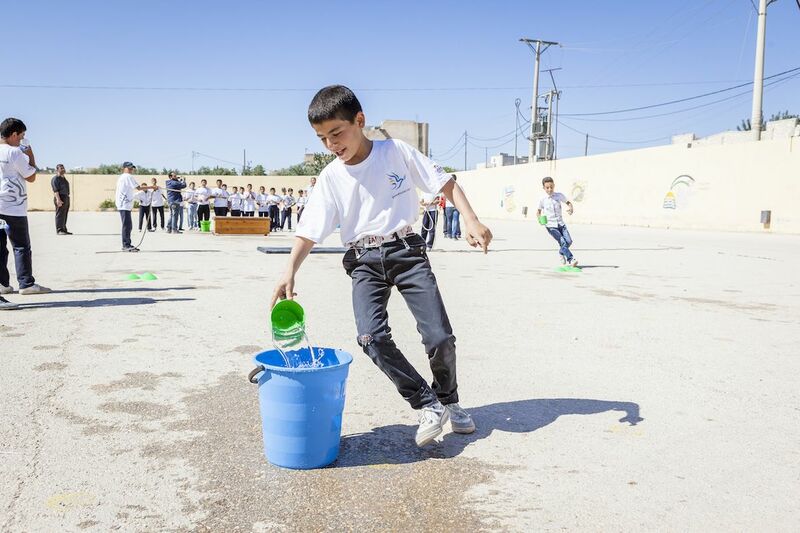 “The cooperation between the Syrians and the Jordanians, and the acceptance that happened between each other, especially in the sport activities – the speaking and conversation that happened among this group was great, they started to speak with other classmates, breaking the barriers of fear” (Jordanian school teacher). The work of Generations For Peace extends far beyond the Syrian Refugee Crisis, to many other communities around the world experiencing violent conflict and desperate displacement. Our volunteers are using Sport For Peace approaches, carefully adapted to local contexts and cultures, to support refugees, displaced people and host communities in northwest Pakistan, South Sudan and Yemen, and to promote deeper understanding and positive engagement between fragmented communities in northern Nigeria, Rwanda and post-conflict Sri Lanka. Through these programs we have seen the transformative power of sport as an innovative tool to engage meaningful youth participation in building peace.